Home Topics Plymouth’s first SUDS pilot site unveiled. New tree pits were recently unveiled in August 2018 in Plymouth by Councillor Mark Lowry as part of a mixed use development in the city centre. Supplied by Green Blue Urban, this demonstration is part of the EU funded Water Resilient Cities project. Keeping storm water out of the sewers, as well as providing a good growing environment for the trees, the tree pits form part of a strategy to improve storm water drainage in the city centre. This will become ever more important as climate change brings heavier storms and as developments bring more people to live in the centre of Plymouth placing more pressure on the city’s sewer network. Sustainable urban drainage solutions (SUDs), such as these tree pits, provide part of the solution to retrofitting SUDs to urban areas where space for new drainage is limited. The public realm scheme at Market Way and Mayflower Street is now complete and has totally transformed the pedestrian space in this part of the City Centre providing an important and attractive gateway into the West End. 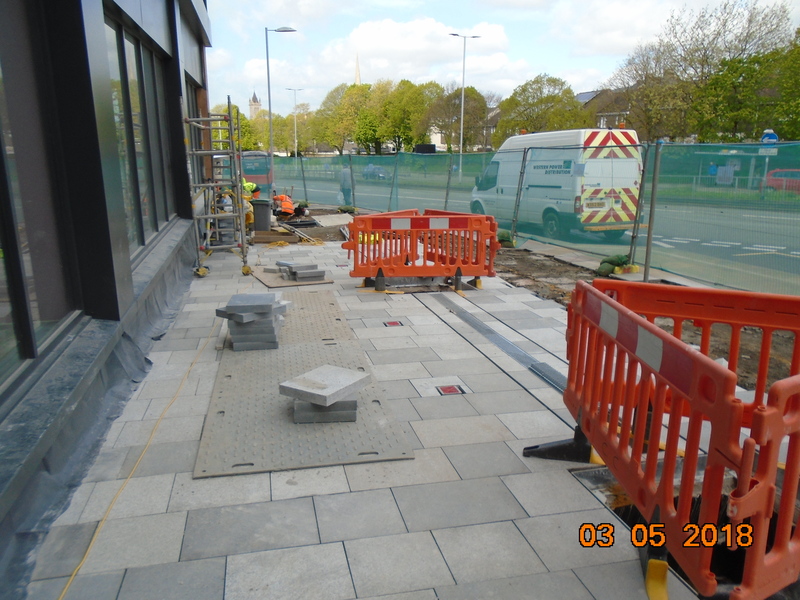 This popular route into the city centre from Western Approach bus stops was previously very steep and unattractive and provided a challenge for the elderly and those with physical impairments to safely negotiate the ramp to safely to access the shops and services in the West End. Plymouth City Council working in partnership with Aspire Student Living 3, the developer of the former Comet building at the corner of Mayflower Street and Market Way, have shared the costs of enhancing the public realm and have delivered nearly half a million pounds worth of improvements. The improvements have seen the steep gradient remodelled to provide a series of gentle ramps and steps fitted with supportive handrails together with a central level seating area and raised terrace to support commercial uses on the ground floor of the former Comet Building. This together with new paving, street lighting, tree, shrub and ground cover planting has created an attractive, safe and high quality entrance to the West End of the City Centre. The development also includes two tree pits, known as Sustainable Urban Drainage System (SUDS), which combine storm water management within urban tree planting to help reduce the risk of flooding during high rainfall events as well as providing dappled shade and more. The development and installation of these tree pits was co-financed by the Water Resilient Cities project, an Interreg 2 Seas programme which is funded by the European Regional Development Fund. The works begun in January of this year proved very challenging to deliver with contractor Creative Construction of Plymouth having to deal with a spider’s web of services close to the surface and poor ground conditions which hampered the build. Working collaboratively the contractor, developer and Council have worked around the problems to find solutions which have delivered significant gains for the public and city as a whole. The Council would like to thank local residents and businesses for their patience and understanding through the construction process. As well as improving access and providing a safer, more attractive pedestrian route into the West End, the Council hopes that the improved appearance will encourage further investment in the city centre. Cllr Mark Lowry, who has responsibility for the city centre and finance said: “This is a small step in improving this area for all and I would like to see further improvements to enable more people to better access and park in the West End and take advantage of all the great things that are on offer here. It’s another good example of what can be achieved when the private and public sector work together”.